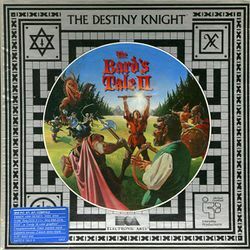 The Bard's Tale II: The Destiny Knight is a computer fantasy role-playing game created by Interplay Productions in 1986. It is the first sequel to The Bard's Tale. It was designed and programmed by Michael Cranford, and won the Origins Award for Best Fantasy or Science Fiction Computer Game of 1986. A measure of distance during battle, which allowed the addition of archery and ranged weapons and spells. Considerably more plentiful and harder puzzles. Real-time dungeon puzzles (called "snares"). A new spellcaster character class (archmage). The ability for multiple summoned creatures to join the party. The ability for summoned creatures to be included in saved games. Banks (unlike money being carried, money stored there would not be lost if the party was defeated). Casinos (where one could play blackjack). A wilderness area containing six cities and 25 dungeon levels. Characters can be imported from Bard's Tale I, Wizardry: Proving Grounds of the Mad Overlord, or Ultima III: Exodus, or created from scratch. A wizard named Saradon, having heard the news of your victory over the evil wizard Mangar, contacts you with dire news: lawless mercenaries from the neighboring kingdom of Lestradae — under the guidance of an evil Archmage known as Lagoth Zanta — have stolen the Destiny Wand, a uniting force which has maintained peace and prosperity for 700 years. Lagoth Zanta has since gone into hiding, having broken the Destiny Wand into seven pieces. He has placed each fragment into a "snare of death" — real-time puzzle rooms located in the depths of each of the realm's dungeons. After reforging the Destiny Wand and becoming the Destiny Knight, you must face Lagoth Zanta in a final surprising encounter. This page was last edited on 30 May 2016, at 14:27. This page has been accessed 9,706 times.